Shankhar is the 1-month-old baby of Lavanya and Lakshmaiah. His illness showed as just slight breathlessness. But just 5 days ago, his breathing became very laboured. 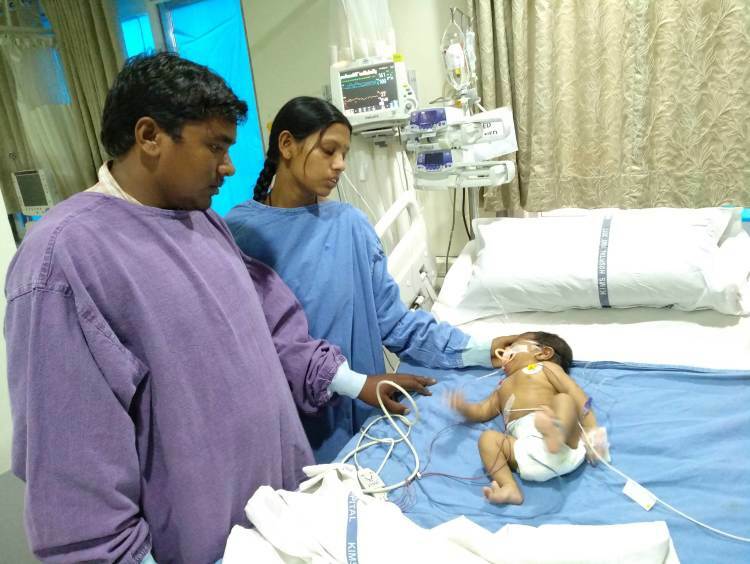 They brought baby Shankhar to Hyderabad where they were told that he would not make it without a surgery. 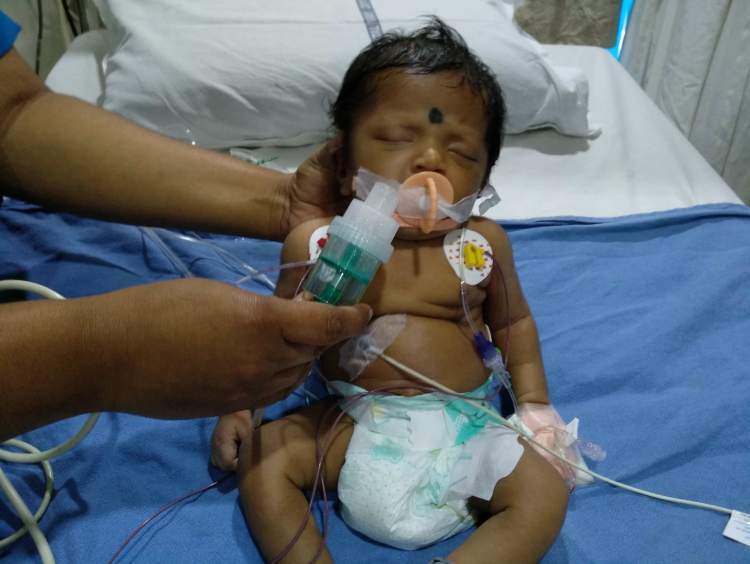 Shankhar, has a severe congenital heart condition called double aortic arch, which is a severe abnormality in the heart. This extra growth presses on the windpipe making it hard to breathe. Without the ongoing urgent surgery, the baby who hasn't even opened his eyes properly will not be able to see the world ever again. Lakshmaiah had no money to come to Hyderabad for his baby’s treatment. But he knew that delay by even a day could be fatal. 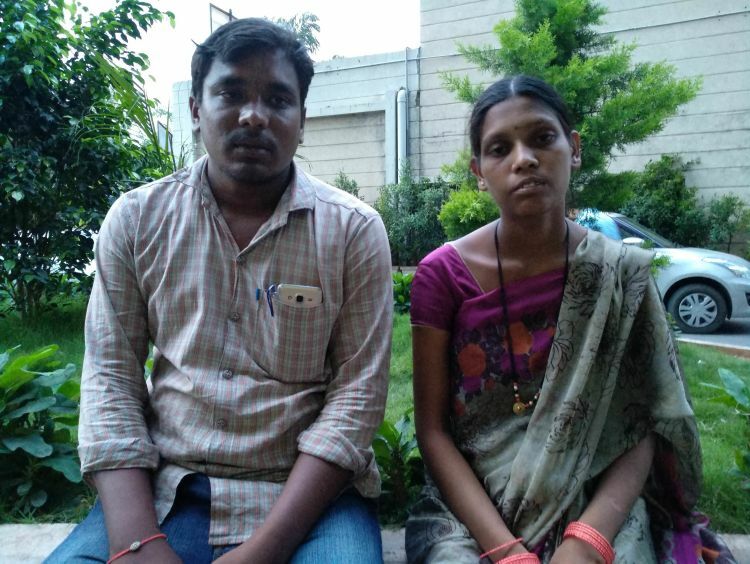 He borrowed from all his relatives to make this life-saving trip from his village. Lavanya is shattered. 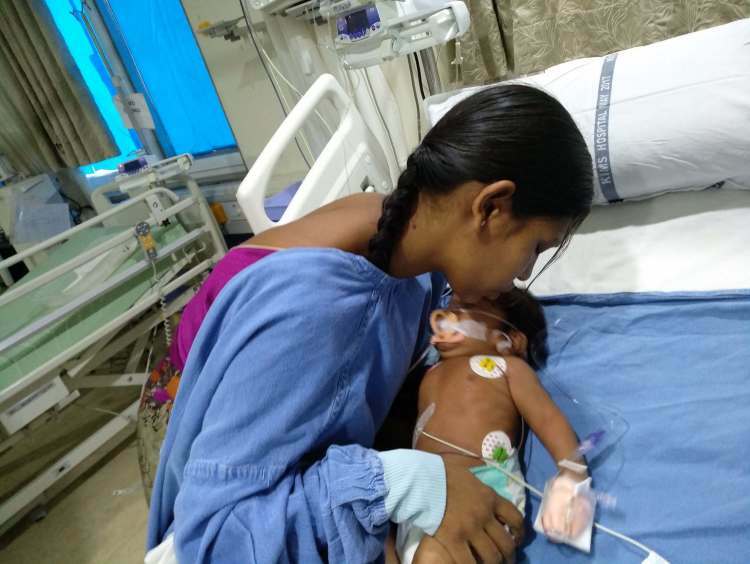 Her baby is struggling for his life even before saying his first words. The family cultivates rice in their hometown in Telangana. Lavanya and Lakshmaiah work in the fields all day. They barely earn anything apart from food for sustenance. It is very difficult for them to earn anything. It’s been a few hours that Shankhar has been taken inside the operation theatre. Lavanya hasn’t stopped crying. The family has been standing outside helpless praying for the life of their child. Even if he comes out alive, he has to stay in the ICU for a considerable period of time so he is out of danger. The family is away from their home and both of them haven’t been able to go on the farms for quite a few days. Their crops might get affected and they will suffer a lose beyond recovery. To them, saving the life of their little baby is far more important at this point. The family has already spent over a lakh rupees now. Lakshmaiah is in neck-deep debt and he doesn’t know if he will ever be able to repay it back. He is just waiting for his baby to become fine so that he can take him back home and reunite with his daughter. The poor farmer family has already exhausted everything that they received help. 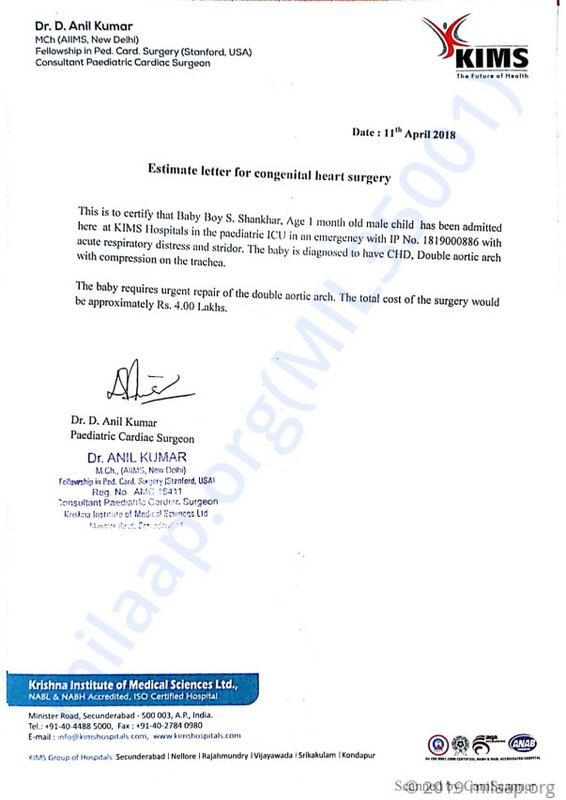 Shankhar is struggling for his life in the operation room and needs a huge amount of Rs 4 lakhs rupees to live. 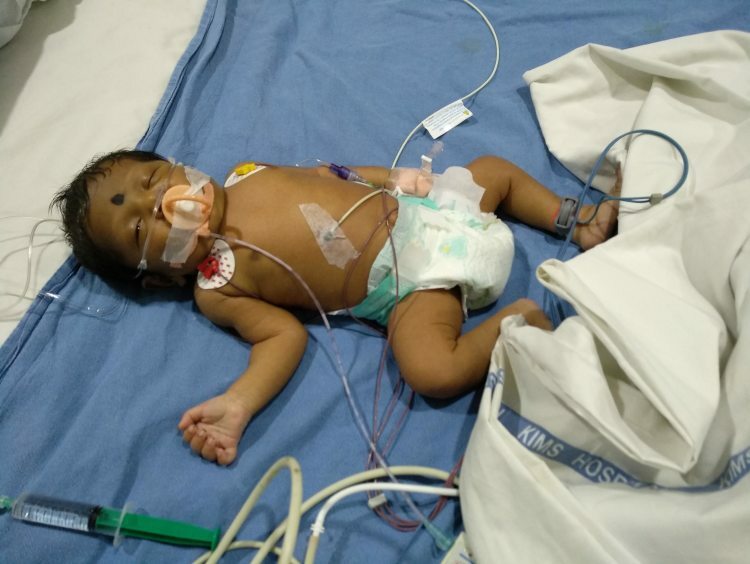 As of now, the baby Shankar is off ventilator and is being shifted from ICU to ward. There is a significant improvement in his health. The doctors will still monitor him in the coming weeks and suggest a future course of action. The parents are relieved to see their son off ventilator support and really thankful to all of you who supported them. It's still a long road ahead of us and we request you all to kindly pray for his speedy recovery. Get well Soon dear baby ! You are in my prayers little one.